So, you have a TOTAL account and you want to know how to integrate with Anow. Follow the simple steps outlined here to get started! 1) To link your TOTAL and Anow account, you will first need your TOTAL Customer Number. Your TOTAL Customer Number is available by clicking Help/About in TOTAL, and there you can view your Customer Number under the License to: section. 2) Next, you will need to enter your TOTAL Customer Number into Anow; to do this, go to your company settings in Anow. Scroll to the bottom of the page until you see the Integration Keys section. Click Edit and make sure TOTAL and CUSTOMER NUMBER are selected, then enter your TOTAL Customer Number in the fillable field. Be sure to click 'Save'. 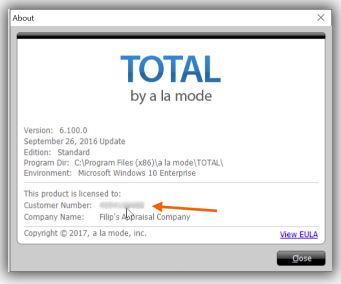 3) You will now see a TOTAL button on the Appraisal Details page for all orders you have in Anow. Click this button on any order to send those details from Anow to TOTAL!